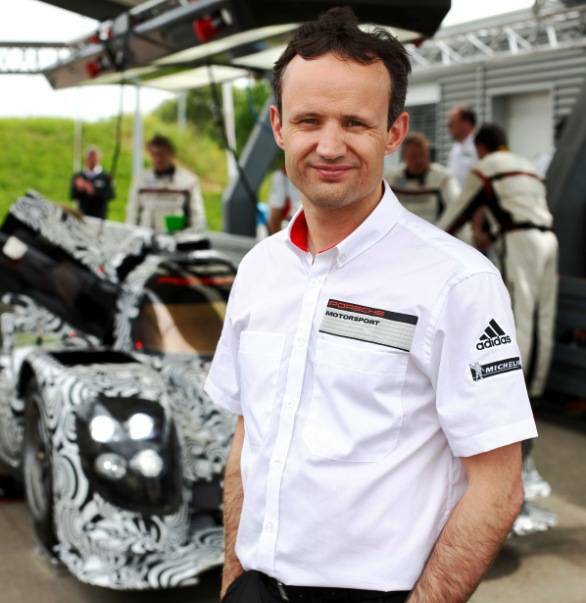 Our conversation with Alex Hitzinger, the Technical Director of the Porsche LMP1 project. How quickly did development happen on the 2014 car, since the decision was made to come back? The decision was made in July 2011 and then it sort of started very slowly. My colleague Fritz Enzinger came on board on the 1st of November, 2011, if I'm right. And I came on board on the 1st of December. And that's when it really took off. We did concept studies. We finished the concept study around about the middle of 2012. Then we designed all the components of the car, manufacturing the car, building the car, so then the roll out was in June. And now we are going testing with the car at various international racetracks. So we have done 6 tests so far. Every two to three weeks we do a test. Based on the experience we gain with the car, we make changes, improvements to the individual areas and so we'll have a significant update to the car. The current car we call the 2013 test car, and there will be the 2014 racecar which we will start using beginning of next year. What is the longest test you've done so far in terms of endurance? At the moment we are not doing endurance tests yet. We are doing more of concept, evaluation, functionality and performance tests. Beginning of next year we will do endurance tests. But the whole period between when we start with the test car and have the first race, that whole period is not very long. Was it a conscious decision to let Porsche drivers such as Romain Dumas move to Audi so that they could gain LMP1 experience? For them to go to Audi was just so that they keep on the top level. They keep racing with top level LMP1 cars. So they stay sharp, gain the latest know how in terms of requirement, in terms of driveability and all those kind of stuff. So it just made sense for them. And then when we were at the position when they could come and run our car, then of course they had to stop with Audi. Typically when you're doing an endurance test, how many hours would that be? We will attempt 30 hours. It has to be more than 24 hours, there has to be some safety margin. There is always an element of luck in there, because if you have an accident or whatever. A race is always still different to a race simulation. And when you do a race simulation, what track would you use? You just do more laps to ensure you get a similar race distance. Is there something you're particularly happy about in terms of the development that's happened so far? I think we have a very good concept and we have started to run the car reasonably early, which gave us the opportunity to still make changes to the test car before we go racing and I think that was very important to get the early first sight of the car, a feeling for the car and understand the areas for improvements. And we found that early we were able to react - and that will all come in for the 2014 car's good. In terms of the hybrid component that is now a part of Le Mans. Was that terribly challenging given the fact that Porsche was starting ground up? Very challenging. But it gives you lots of development freedom and there's nothing you can just buy from the shelf. Basically we had to develop everything ourselves. We didn't want to just copy something else. We looked at the available technologies, the possible technologies and compared them and made the conscious decision for what we believed is the best technology. But that technology we had to develop ourselves. So that was and still is very challenging. We had to do everything in a very short period of time. We also made the conscious decision to develop it ourselves and not subcontract it to an external company, which is although is always possible. Because we want to build up that know how within Porsche, so then as Porsche we can use that know how for other projects and so on. How important would this win be for Porsche? I think extremely important. Porsche by then has not been in the top level of motorsport, top class, for 16 years. And I think everybody knows the tight connection between the Porsche brand and motorsport victories, motorsport success. I guess at some point you have to write new history. There is no information sharing with your sister concern Audi? How important is it for you to beat them? Very. Of course! They're our competitor. In terms of driver selection. What was the process behind that? I mean for endurance racing it's very important to form a homogenous team of drivers. They need team players because they'd have to share one car. So they all have to make compromises in terms of ergonomics, in terms of setup. So you don't want to have two strong egos. Of course all drivers have egos, but you have to have people who are able to compromise. You need drivers who are consistently fast. And this is very important - they need to be consistent and fast. There's no point to have someone who can put down a quick lap but can't do it consistently. So there are various different factors that make a good endurance driver - experience as well. We use these factors to judge individual possible options. Of course we also have, let's say, the luxury, with Romain Dumas and Timo Bernhard, to have two experienced guys already in the cars. Then with Neel Jani, he's a fast driver and also experienced in LMP1. He's also a good team player and fits in. Mark Webber again is a fast driver who has already raced in Le Mans. He's a good team player. And we already have four good drivers. Is this the biggest challenge of your motorsport career? Yes. But it should be. There should be a progress. I mean I have had other challenges before, very big challenges. But I would say this is the biggest. Big also because it's the complete car. Why did you decide against outsourcing the hybrid component to another organisation? It's not so much about not trusting others because that would be a bit arrogant. No, if you do it yourself you have full control. Full transperancy, you can react quicker and make decisions quicker. And you protect the know how. So secrecy is easier. And the final thing is if we know how it's built up internally, Porsche can then use that for other projects. That was one of also my driver for trying to keep everything in house. So a lot of the hybrid technology is developed internally specifically for that reason.